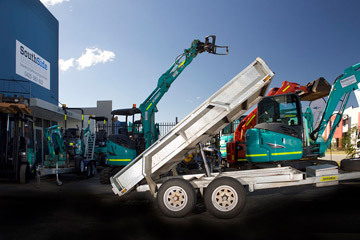 Get the trailer transport hire you need for your Perth project today - tip trailer hire, trailer accessories, aluminium ramp hire and more. 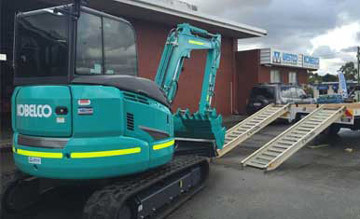 At SSE Plant Hire, we not only take care of all your plant and equipment hire needs; we can also provide you with the necessary plant transport to get your machine from A to B - free of charge! SSE Plant Hire can provide the transport for your truck hire or trailer hire to be at your site today, so you can keep your project rolling. SSE Plant Hire can supply complimentary plant trailers with equipment, at no additional cost to your original hire. We can also arrange the hire of plant trailers separately if you require. Simply get in touch with us for pricing. You can hire out four different types of trailer transport solutions from us, depending on the machine you need to transport. To get a better idea of the trailer you require, take a look below. In addition to plant trailers, SSE Plant Hire also supply tipper trailers for hire. The 2 Tonne Tipper Trailer hire is perfect for small DIY jobs involving carting sand and waste and can be towed by a normal vehicle with a towing capacity of up to 2.5 Ton. If you're unsure whether or not this item is right for you, contact our team on (08) 8120 2703. 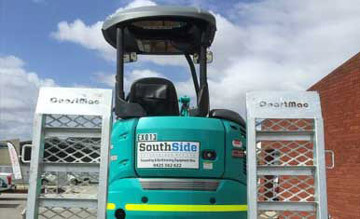 SSE Plant Hire supply 3.6 Tonne Sureweld Aluminium Ramp hire. Sureweld 3.6 Tonne Track Series Aluminium Machinery Loading Ramps are designed for use with Steel Tracks including Steel Tracks with Rubber Pads and Rubber Tracks. The tread surfaces in the aluminium ramps range are highly robust and are configured to resist damage from tracks. Featuring the greatest versatility, these models can be used with tyres, as well as with tracks. Machinery with tracks, as well as machinery with pneumatic air tyres, are to be loaded. Ask one of our experts if this is the right item for you: call (08) 8120 2703. SSE Plant Hire has all your trailer transport hire needs sorted. If you're in the Perth, Fremantle, Mandurah, Joondalup and you require tip trailers, aluminium ramps or any other trailer accessories, please contact us today.